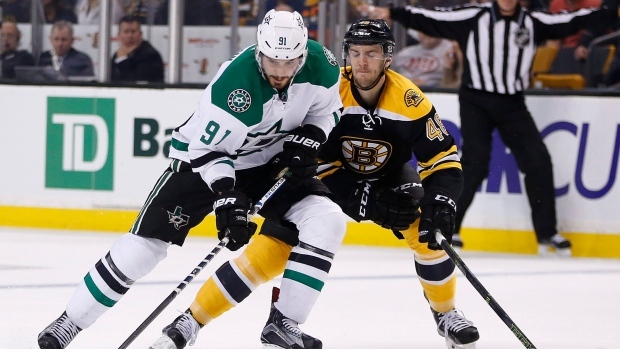 BOSTON - Tyler Seguin scored three goals against his former team as the Dallas Stars beat the Boston Bruins 5-3 on Tuesday night. Jyrki Jokipakka scored his first NHL goal and Alex Goligoski scored his first of the season for the Stars, who ended Boston's four-game winning streak despite being outshot 39-19. Jason Spezza and John Klingberg had two assists each for the Stars and Kari Lehtonen finished with 36 saves. Boston, unbeaten on the road, has yet to win consecutive games at home this season. Loui Eriksson scored twice for Boston, cutting Dallas' lead to 5-3 with 2:15 left to play. Boston's Colin Miller scored his first career goal and Torey Krug had two assists. Tuukka Rask had an ugly night in the net, allowing five goals on just 19 shots and was mocked by Boston fans when he made an easy stop late in the game. Boston lost centre Chris Kelly 1:40 into the game with a broken leg. Seguin's seventh career hat trick was his sixth with the Stars, who picked him up in a trade with Boston in the summer of 2013. The Bruins selected him in the first round of the 2010 draft. Seguin, who put Dallas up 1-0 5:46 into the game, tied it at 2-all with a power-play goal 4:37 into the second on a slap shot from the left circle. Bruins fans booed both goals by Seguin, who added his third on a one-timer 1:18 into the third period that put the Stars up 4-2. Notes: Kelly grabbed his left leg after going down in front of the Bruins' bench and stayed down on the ice for several minutes before being helped to the locker room. Boston GM Don Sweeney said in a release that the leg was broken and Kelly would have surgery on Wednesday. ... Dallas D Devin Shore made his NHL debut. ... Seguin extended his points streak to six games.